For National Deaf Awareness Week (Sept. 24-30), Faultlines releases incredible ASL (American Sign Language) music video for “LOVE IS ALL WE OWN” which released exclusively on Revry.tv Sept. 21. 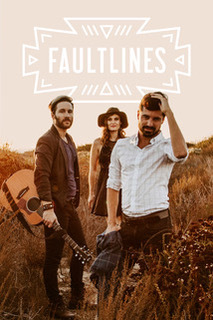 Faultlines is an acoustic folk-pop group known for their three-part harmonies that warm like the California sun and lyrics that speak to the gritty, universal interhuman experience. "I wrote 'LOVE IS ALL WE OWN' for audiences to sing along," songwriter John Flanagan said. "It's a counter-protest song to 'RAIN.' Both songs acknowledge our current political state, but at the end of all the rallies, the marches and the voting drives, we have to come home to ourselves and live in our love, not our anger. In this highly-charged era in which people are being pigeonholed by their differences, 'LOVE IS ALL WE OWN' implores us to recognize our similarities." "Our original idea was to make a simple lyric video, but there is an incredible girl, Libby, that comes to every one of our concerts and sings along to our songs," vocalist Ashley Morgan said. "We thought it would be a beautiful concept to bring a diverse group of people together and have her teach everyone ASL. In a world where people are being torn down because of their differences, we choose to celebrate and recognize that we are all stronger because of our diversity. No matter your race, gender, sexual orientation, religion, weather you are blind or deaf, Love is all we own. It is important, above all, that we come together and remember this. We're really excited for the opportunity to bring the message of our music to everyone, even those that cannot hear it. This song is for everyone." It’s in the spirit of Women's marches and twenty-first century activism that Faultlines recorded songs like "RAIN" and "LOVE IS ALL WE OWN." In search of ways to instigate societal change, the band recently hosted two benefit concerts that raised over $30,000 for the ACLU of Southern California and Planned Parenthood of Los Angeles. "Folk music is the music of the masses. It's about people, not just pretty words. It should say 'this is how we feel.' 'BITTERSWEET REVIVAL' was created simply and anthemic in order to reach all people. "There is hope in people, strength in our numbers, and power in our voices," Flanagan said. This album offers equal parts optimism and outcry, as 2018 is a year for both. For Faultlines, at least, 'BITTERSWEET REVIVAL' transmits the soundtrack to this future." Our ASL teachers were mother and child Sarah and Libby Schmidt, who are Faultlines fans. They frequently sign along to songs during shows, and the band was inspired by their enthusiasm to share their ASL knowledge. LOVE IS ALL WE OWN is Faultlines' oldest "new" song. The band has been performing it live for audiences domestic and abroad since March 2017 - well over a year before the album's release. Revry is the first global queer streaming network, available in 35 million homes in over 100 countries, with a uniquely curated selection of LGBTQ+ film, series, and originals along with the world’s largest queer libraries of groundbreaking podcasts, albums and music videos. Revry is available worldwide on seven OTT, mobile, and online platforms, and hosts the exclusive LGBTQ+ channels on Pluto TV and XUMO. Headquartered in Los Angeles, Revry is led by an inclusive team of queer, multi-ethnic and allied partners who bring decades of experience in the fields of tech, digital media, and LGBTQ+ advocacy. Follow on Facebook, Twitter, and Instagram @REVRYTV. Go Online to: revry.tv.